Both Steve Nash and Jamaal Maglorie have appeared in the NBA All-Star Game. Who will be next? Ranked 17th in the NBA in three-point field-goal percentage with .403 in 1999-2000. 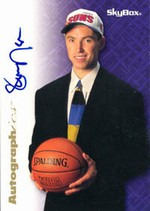 Canadian-born Steve Nash after a successful career at Santa Clara University was a first-round draft pick of the Phoenix Suns in 1996. Subsequently found his basketball home in Dallas with co-horts Dirk Nowitzki and Michael Finely to form another Dallas "Big Three." Plays a classic point guard and is known to drive to the basket with reckless abandon where he can make the layup or deftly pass to a teammate for an easier basket. Has developed a consistent outside shot which makes him even harder to defend. Appeared in 56 games (27 starts) and averaged 8.6 points, 4.9 assists and 2.2 rebounds per game in 27.4 minutes....Played his best at the end of the season after returning from a right ankle tendon strain which cost him 25 games....In the last 10 games he averaged 13.6 ppg, 8.1 apg in 40.1 minutes....Scored in double figures in 15 of the last 20 games and 24 times overall....Had six double-doubles all of which came in the last 19 games....Played a career-high 51 minutes at Denver on 4/6/00....Posted a season-high 11 assists twice - 3/16/00 at San Antonio and 3/27/00 at Utah....Twice went 10-11 from the foul line to post career-highs in both of those categories - 3/27/00 at Utah and 4/18/00 vs. Lakers. Played in 40 games and averaged 7.9 ppg on .363 shooting with 5.5 assists in 31.7 minutes....Led the Mavericks with 219 assists and ranked second in free throw percentage (.826)....Missed the final 10 games of the season due to a lower back strain....Scored in double figures 12 times and dished-out 10-plus assists five times. Ranked 13th in the NBA in 3-point accuracy (.415), connecting on 81-195 with the Suns....Connected on 74-86 (.860) free throws, tops among the Suns....One of the most improved players in the NBA, Nash bettered his rookie numbers by 5.8 points, 1.1 rebounds, and 1.3 assists. Averaged 3.3 ppg on .423 shooting with 2.1 assists in 10.5 minutes as a rookie....Tallied 17 points, 12 assists and seven rebounds on 11/14/96 at Vancouver, his only start of the season....Connected on 42-51 (.824) free throws and 23-55 (.418) 3-pointers....His 3-point accuracy was second-best ever for a Suns rookie (Wesley Person .436). At Santa Clara, he was twice named the West Coast Conference Player of the Year (1994-95, 1995-96), the first Bronco to do so since Kurt Rambis....Finished career as the Bronco's all-time leader in career assists (510), free throw percentage (.862), and 3-pointers made and attempted (263-656)....Third on the school's all-time scoring list (1,689)....Holds Santa Clara's single-season free throw percentage record (.894)....Named Honorable Mention All-America as a senior by The Associated Press and the USBWA....Two-time Wooden Award candidate....Averaged 17.0 points, 6.0 assists, and 3.5 rebounds as a senior....Only the fourth player in WCC history to lead the conference in scoring and assists in the same season, a feat first accomplished by John Stockton....The first freshman named Most Valuable Player of the WCC Tournament....Scored 40 points (knocking down 8-17 3-pointers) at Gonzaga in 1995....Was 21-21 from the free throw line against St. Mary's in 1995....Nailed six straight free throws in the final 31 seconds to top Arizona in the 1993 NCAA Tournament as a freshman....Played for the Canadian National Team in 1993 and won a silver medal after a loss to the Team USA in the World University Games, which included such players as Michael Finley and Damon Stoudamire....Played for British Columbia in the 1993 Canada Games winning a bronze medal....A member of the 1996 Nike Desert Classic All-Tournament team. Weight: 259 lbs. / 117,5 kg. Started 12 games as a sophomore for Kentucky team that won the 1998 NCAA championship. Averaged 8.5 points and 5.6 rebounds to lead all bench players...Shot 61.9 percent from the field over the last 27 games of the season...Started eight...Games for the Hornets, averaging 14.5 points and 7.8 rebounds while shooting 67.6 percent from the floor...Scored 21 points on 8-11 shooting in a career high tying 33 minutes 3/27 vs. ORL...Had 17 points, 10 rebounds and five blocks 2/27 vs. NJ...Started his first NBA game 2/24 at NJ (eight points, five rebounds, one block)...Had 19 points and a career-high 16 rebounds 1/25 at IND...Scored a career-high 22 points (and notched career highs in free throws made and attempted by going 10-13) 12/29 at WAS...After that game, finished the year by averaging 10.7 points, 6.6 rebounds and 1.1 blocks while shooting 57.4 percent (178-310) from the floor over the last 52 games of the season...One of two Hornets to play in all 82 games (Davis)...Reached double-figures in scoring 31 times. Averaged 4.6 points, 4.0 rebounds and 1.05 blocks ... Tied for seventh among all NBA rookies in rebounding and fourth in blocked shots ... Finished 40th in the NBA in blocks ... At Dallas on 3/24, scored 11 points (4-8 FG), grabbed four rebounds in 14 minutes - the most points scored since 11/25 vs. Cleveland ... Scored a season-high 16 points, while grabbing eight rebounds and blocking three shots in 22 minutes at Toronto on 11/20 ... Grabbed a season-best 10 rebounds twice ... Had 22 multi-block games (season-high is six, vs. Atlanta 4/16) ... Scored 10-plus points 11 times on the year ... Led the Hornets in rebounding in five games (Hornets are 5-0 in those games) ... Finished the year shooting 39 of 71 (.549) in the last 18 games ... Missed seven games due to a sore left foot ... Best stretch of the season came in November when he averaged 6.4 points, 4.9 rebounds, 1.4 blocks on 33-63 (.524) from the field in 14.9 minutes. Weight: 280 lbs. / 127,0 kg. Fourth NBA season (Philadelphia)...Placed on the injured list on Feb. 19 with left/right foot neuropathy...consulted with Dr. Robert Brown at Mass General Hospital on Feb. 24, 2003...Dr. Brown also believes that MacCulloch is suffering from symptoms of Charcot-Marie-Tooth (CMT)...MacCulloch continues to undergo treatment for his symptoms...CMT is a neurological disorder affecting the peripheral nerves....underwent treatment for Chronic Inflammatory Demyelinating Polyradiculo-neuropathy (CIDP) on Jan. 15 and missed three games (1/15 versus New Jersey, 1/17 versus Milwaukee and 1/18 at Washington)...was on the bench versus Boston on Jan. 20 but was a DNP-CD...since returning on Jan. 20, had played in five games (averaging 10.8 minutes, 3.8 points and 3.2 rebounds per game in the span), listed as a DNP-CD in four others and was a DND-left/right foot neuropathy three games ... CIDP is a condition of the peripheral nervous system...averaging 7.1 points and 4.7 rebounds in 19.3 minutes, while shooting a team second-best 51.7 percent from the field...has 32 total blocks, recording a season-high four versus Minnesota (12/18)...had a career-high five steals versus the Clippers (11/6)...grabbed a career-high 14 rebounds vs. Milwaukee (10/30), while recording a double-double with 10 points...chosen for the NBA Community Assist Award for October...in his return to the Sixers' line up, scored 13 points in 16 minutes at Orlando (10/29), nine of those points in the first quarter...acquired from the Nets by the Sixers on Aug. 6, 2002, with Keith Van Horn for Dikembe Mutombo. Third NBA season (New Jersey)...in first season as a Net, averaged career-highs of 9.7 points, 6.1 rebounds and 1.44 blocks in 62 games (61 starts)...led the Nets in shooting with 53.1 percent (247-465) from the floor, but did not have enough qualifying attempts to rank in the NBA league leaders...posted eight double-doubles on the season...led the team in rebounding 13 times and blocks 19 times...missed a total of 19 games due to plantar fasciitis in his left foot: was on the Injured List from Feb. 22 to March 20 (15 games) and from April 14 to April 17 (3 games)...did not dress due to the injury versus Golden State on Feb. 19... recorded a DNP-Coach's Decision versus Milwaukee on March 22...Nets had a record of 41-20 when he was in starting lineup...tied a career-high with five blocked shots three times: versus Philadelphia on March 30, versus San Antonio on Jan. 14 and versus Cleveland on Dec. 17...recorded a career-high 13 rebounds and three blocked shots in 31 minutes versus Chicago Nov. 27...scored a career-high 29 points, while grabbing 10 rebounds in 32 minutes versus Seattle on Nov. 8...2002 PLAYOFFS...averaged 6.2 points, 5.0 rebounds and 1.00 blocks in 20 games and starts...scored five points while pulling down a playoff career-high 11 rebounds in Game 3 at Boston (5/25)...tied a playoff career-high with 14 points in Game 1 versus Boston (5/19)...recorded a playoff career-high 14 points and tied a career-high with five blocked shots in Game 1 of the first round versus Charlotte (5/5). Led the 76ers, shooting 58.9% from the field (109-185), but did not have enough qualifying attempts to rank in the NBA league leaders. Played in 63 games, averaging 4.1 ppg and 2.7 rpg in 9.5 mpg. Scored a career-high 21 points on 8-10 shooting vs. Chicago on 4/18 in the last game of the regular season. Scored in double figures in seven games. Shot 4-5 from the field vs. L.A. Lakers on 2/14, finishing with eight points, while tying a team-high with seven rebounds. Tallied eight points and seven rebounds in 16 minutes vs. Atlanta on 1/3. Tied his career-high with 13 rebounds at Chicago on 12/16. Had one of his best games of the season against Cleveland on 12/2; scored 14 points, a team-high 11 points in the second quarter and had three blocks to help the Sixers to a 25-4 run. Was placed on the injured list on 11/20 with left ankle tendinitis, and activated on 12/1 after missing a total of five games. Did not play in 14 games due to Coach's Decision. MacCulloch played in 56 games as a rookie, making six starts, and stepped in nicely when injuries hit Philadelphia big men Theo Ratliff, Matt Geiger and Tyrone Hill early in the season. He played in 31of the first 34 games but just 25 games after that, sitting out the rest due to coach's decision. Also, after logging double-digit minutes in 20 of the first 34 games, he did not play more than nine minutes in any game the rest of the season. He led the team in field goal percentage at .553 and averaged 3.7 points, 2.6 rebounds and 0.66 blocks in 9.4 minutes per game. Among all NBA rookies, he ranked fourth in blocks, 15th in rebounds and 20th in scoring and would have ranked first in field goal percentage but did not make enough baskets to qualify. He posted career-highs of 16 points, with nine rebounds, at Milwaukee on Nov. 27; grabbed a career-high 13 rebounds, with seven points, against New York on Nov. 30; and five blocks and 31 minutes at Orlando on Nov. 10. He had two double-doubles, in consecutive games - 12 points and 10 rebounds against Seattle on Nov. 8 and 10 points and 12 rebounds at Orlando on Nov. 10. MacCulloch participated in the 2000 Schick Rookie Game on All-Star Saturday in Oakland, scoring four points and grabbing five rebounds. He played sparingly in five of Philadelphia's 10 playoff games, scoring eight points and grabbing nine rebounds in 24 minutes. Canadian-born Todd MacCulloch received Honorable Mention All-America honors as a senior at Washington after leading the nation in field goal percentage for the third year in a row, only the second collegian - Jerry Lucas was the other - to achieve that feat. He was drafted by the Philadelphia 76ers on the second round in 1999, the 47th overall selection. The 7-foot center played in 56 games as a rookie, including six starts, and averaged 3.7 points and 2.6 rebounds in limited action. MacCulloch, an All-Pac Ten First Team selection in both 1998 and 1999, posted a career field goal percentage of .664 in 115 games for Washington, with averages of 15.2 points and 8.5 rebounds per game. After earning a place on the All-Pac 10 Freshman Team in 1995-96, he led nation with field goal marks of .676 as a sophomore, .650 as a junior and .662 as a senior, when he averaged 18.7 points and 11.9 rebounds per game, the latter ranking second in the nation. Should Rick Fox play on our National Team? Weight: 235 lbs. / 106,6 kg. 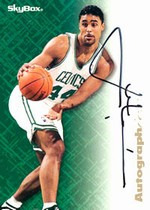 A versatile 6-7 swingman who can shoot, pass, and run the floor, Rick Fox showed flashes of stardom during his NBA career and averaged a career-high 15.4 ppg for the Boston Celtics first four years he served as a valuable role player for the Celtics, coming off the bench at off guard or small forward behind the likes of Larry Bird, Reggie Lewis, Dee Brown and Dominique Wilkins. He was Boston's team captain before becoming a free agent and heading for Hollywood, where he was also pursuing an acting career on the side. He signed with the Los Angeles Lakers as a veteran free agent and started in all 82 games in 1997-98 before assuming a reserve role in 1998-99 ...Fox is recognized by his co-starring roles in such shows as HBO's "Oz," and his marriage to actress/singer/model Venessa Williams. Averaged 9.6 points, 4.0 rebounds and 3.2 assists in 27.9 minutes ... started 77 games this season, including the last 68 straight ...ranked among league leaders in three-point field goal percentage (.393/30th) ...led the team in assists in three consecutive games (3/38 - 4/1) and averaged 6.7 assists (20) in that period ...recorded season-highs in minutes played (39) and three-point field goal attempts (9) 12/30 at LA Clippers ...handed out a season-high nine assists on two occasions 12/10 vs. Detroit and 12/30 against LA Clippers ...grabbed a season-high 12 rebounds 12/22 at Dallas ...tallied double-digits in scoring in six consecutive games, highlighted by a season-high 22 points 12/25 vs. Portland ...converted 4-of-4 three pointers 12/19 at Miami ...Started each of the Lakers 16 playoff games averaging 9.3 points, 4.9 rebounds and 3.4 assists in 35.5 minutes ...registered postseason-career-highs in rebounds (10) and minutes played (45) 5/6 vs. Sacramento ...tallied a postseason-career-high five steals 4/26 vs. Portland. Fox scored 10.8 points per game for one of the NBA s most balanced teams in 1993-94 ...A total of seven Celtics averaged in double figures on the year ...In playing twice as many minutes as he had the season before, Fox was finally able to settle into a groove on the court ...With additional playing time and confidence, nearly all of the swingman s offensive numbers increased ...As a testament to his improvement, he scored a career-high 33 points against the Milwaukee Bucks on March 29, sinking 17 of 18 free throws. Fox was named to the NBA All-Rookie Second Team after averaging 8.0 points and 2.7 rebounds in his first season ...He played in 81 games, often filling in for Larry Bird, whose injuries limited him to 45 games in his final NBA campaign ...Fittingly, Fox became the first Celtics rookie to start on opening night since Bird in 1979 ...On November 30 Fox scored a season-high 31 points against the Atlanta Hawks ...He grabbed a season-high 9 rebounds on January 19 against the San Antonio Spurs ...Fox averaged 3.6 points in eight playoff appearances as the Celtics beat the Indiana Pacers in the first round before losing a second-round series to the Cleveland Cavaliers in seven games. Another well-rounded product of the Dean Smith school of basketball, Fox was drafted by the Celtics in the first round of the 1991 NBA Draft ...A native of Toronto, Fox grew up in the Bahamas and then went to high school in Warsaw, Indiana ...He attended college at North Carolina, teaming with a host of future NBA players and leading the Tar Heels to the 1991 NCAA Final Four ...He departed UNC as the Tar Heels all-time leader in steals with 197 ...In four seasons at UNC, Fox never missed a game, tying a school record with 140 appearances overall.